The more challenging group of students, Tompkins says, are those who have no tradition of organized religious practice but are interested in spirituality, either exploring it for the first time or exploring one that is different from the one in which they were raised. In a community of high achievers, some students labor under feelings of intellectual and/or social inadequacy. 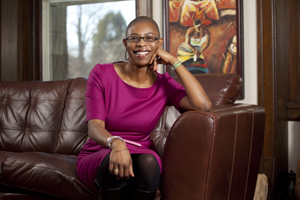 Karlene Burrell-McRae, director of the College’s Black Cultural Center (BCC) says that one of the greatest challenges she faces is “perfectionist syndrome,” which can affect any student. “There’s a degree of shame in asking for help,” she says. Burrell-McRae believes that her protégés sense a stigma attached to having problems, whether personal, academic, mental, social, or physical. “When students are used to being in the top 1 percent of their class and their families have such high expectations of them, the burden and stress associated with having to be perfect prevents them from being well,” she says. So that they feel less alone, Burrell-McRae tells her students stories about situations similar to their own, either from her own experiences or those of students in her former workplaces. “Being able to ask for help is a strength, not a weakness,” she says. The BCC is one of several entities that nurture social wellness. Others include the resident assistants program, the Social Affairs Committee, the Women’s Resource Center, the Intercultural Center, and the International Students Organization. While social wellness is the concern of administrators like Burrell-McCrae, others assist students who, in times of stress, seek comfort in mood-altering substances. The College’s drug and alcohol counseling program, sponsored by the Dean’s Office, is run by Tom Elverson ’75, alcohol education and intervention specialist. Elverson oversees campus groups comprising the Drug and Alcohol Resource Team; the Party Associates Coordinators, who are responsible for ensuring safety at on-campus social events; and the two campus fraternities Delta Upsilon, of which he is a member; and Phi Psi. If necessary, Elverson is the College’s liaison to the court system. “When students are charged with underage drinking, I help them through the court process.” A former borough councilman, he meets regularly with the local chief of police to enhance communication between the College and police department to ensure that students receive the correct clinical and judicial support. With respect to alcohol consumption and drug use on campus, Elverson says, “In keeping with a College policy that advocates responsibility while following Pennsylvania state regulations, Swarthmore is on the lower end of the spectrum around issues of hospitalizations, citations, court appearances, and interventions.” Elverson bases his statement on a 2007 comparative study of six colleges similar to and including Swarthmore. “I have no exact current figures, but I’d say we’re about average or below, compared with other schools,” he says. Another commonly abused substance is nicotine. Although fewer people ages 17 through 25 are smoking cigarettes, the rate of decline has slowed during the last few years, according to a recent report on tobacco use from the U.S. Department of Health and Human Services. 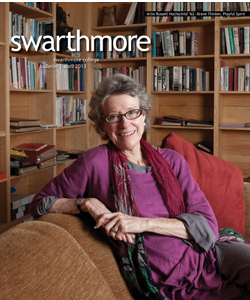 That Swarthmore students are susceptible to this form of substance abuse is worrying for Bennett Lorber ’64, Thomas M. Durant Professor of Medicine, Professor of Microbiology and Immunology at Temple University School of Medicine, and a member of Swarthmore’s Board of Managers. Lorber would like to see the College’s smoking policy revisited. Currently, smoking is prohibited in all indoor public spaces campuswide and outdoors within 25 feet of entrances to buildings. “As a physician, I am particularly interested in direct human sustainability—the sustainability of human life,” Lorber says. “The health and wellness benefits of exercise, stress relief, good nutrition, and many other things pale when compared with the adverse health effects of smoking. I visit the campus quite regularly, and my observation is that the number of students smoking cigarettes, at least in public, has increased in the last few years. Why are such bright people doing something so dumb? Much of what we think of when we consider the “quintessential college experience” involves behaviors and activities that might not necessarily be in the long-term best interests of the students, contends Dean Liz Braun.